Recorded live at The Bell Inn, Derby, ca. spring 1981. For fans of traditional jazz, particularly of the New Orleans variety, 1998 did not end on a good note as a week before Christmas Chris Blount died unexpectedly on Dec. 18th. A devotee of the New Orleans style, he had led his jazz band for over three decades and was well known in Britain and Europe from the many tours on which he and the band had undertaken. It has often been remarked that Blount was a disciple of George Lewis, and not only of Lewis’ clarinet style but the Lewis band’s style. While all of the tracks on this CD give some evidence of such influences, the first track, Hindustan, exemplifies these clearly, particularly the emphasis on collective improvisation. Hodgkinson lays down a clean lead on trumpet and doesn’t stray far from it in the rest of the track. One is always reminded of the melody in the ensembles even when it is not specifically delineated, and Hodgkinson never overblows. He uses vibrato sparsely and has a tone which embraces the listener. The rest of the rhythm section does not fare as well as it might, the balance lacking somewhat so that we don’t hear much of Slater on string bass, but we do hear the bass drum, which tends to pound out four beats per measure. However, Ellis does insert nice accents on the snare (and tom tom elsewhere) from time to time. Trevor’s piano is mainly in the background except where he is given a solo, as he is on this first track. Other solos on other tracks are taken by Blount and Vickers, that by Blount coming invariably first and that by Vickers immediately following the piano solo. All of the other choruses are ensemble, and they all show pleasing variety—no repeating licks between choruses. Each chorus is, indeed, a musical conversation among the players. While Hindustan is over six-and-a-half minutes long, it seems to be much less, the coda coming all too soon. As I said above, these traits are to be seen in just about every track. Overall, solos are relatively few, usually only two or three in a track, these most often being by Blount, Vickers, and Trevor, often in that sequence. Brennan is given one on Don’t Give Up the Ship and Hodgkinson one on Running Wild, but Slater and Ellis are passed over in this regard. All of the other choruses are taken by the ensemble, and wonderfully entertaining they are. While it is interesting to hear a competent soloist’s improvisation on a tune, it is much more exciting to me to hear how the several players complement each other in the collectively improvised choruses. Of such interplay in ensembles this band was a top purveyor. 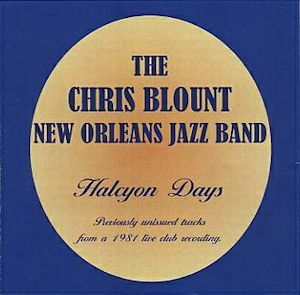 This CD is a welcome addition to the Blount Band’s discography, marking as it does the 20th anniversary of Chris Blount’s passing. Perhaps other recordings will surface in the near future and be released, which Blount aficionados and the rest of the traditional jazz community would certainly receive with relish. Undoubtedly this CD will—and should—get such a reception. PKCD-415 is available from p.e.k. SOUND at www.jazz-at-peksound.co.uk and undoubtedly also at on-line outlets such as Amazon and Upbeat Records.